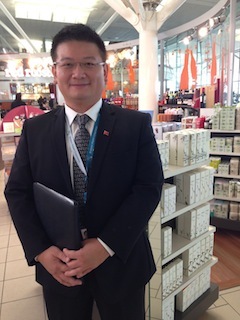 The appointment of a Chinese Liaison Officer and Chinese Cultural and Customer Service Training are two initiatives being introduced under Brisbane Airport Corporation’s (BAC) ‘China Strategy’, designed to provide assistance to Chinese-speaking travellers and help airport staff to better engage with this growing visitor market. Andrew Brodie, General Manager Airline and Commercial Businesses BAC, said with Chinese travellers being one of BNE’s strongest growing passenger markets it was vital for BAC to devise an over-arching ‘China Strategy’. “BAC and our partners and retailers are committed to providing our Chinese visitors with a highly personalised level of service to ensure their trip through BNE is enjoyable and memorable, so we’re looking at any and all initiatives we can introduce to achieve this. “Visitors from China are BNE’s fastest growing market and we expect this growth to continue. “The airlines are increasing frequency and/or capacity over the coming months to accommodate future demand, so our focus on this market is essential. “It’s so important that we are in the process of engaging a specialist consultant to assist us in developing a high level ‘China Strategy’ moving forward,” Mr Brodie said. For the past two years, BAC has hired a Chinese Liaison Officer to work in the BNE International Terminal for a one month period over Chinese New Year when visitors to and from China peak. Based on the success of this initiative, the posting of a Chinese Liaison Officer at BNE’s International Terminal has been extended to a five month period from 23 September 2013 – 28 February 2014, covering peak Chinese travel times including Chinese National Day, Christmas, New Year and Chinese New Year. The Chinese Liaison Officer, who speaks fluent Mandarin Chinese and is familiar with the culture and preferences of Chinese travellers, will meet and greet departing Chinese-speaking passengers, assist with check-in, security and customs processes and way finding through the terminal. He is also able to provide tips on shopping and helping to find gifts for loved ones and answering questions about where to find certain products and stores. For the third consecutive year, BAC will also be offering Chinese Cultural and Customer Service training to International Terminal retailers to provide staff with the skills and knowledge on how to warmly welcome, engage with, look after and drive spend from Chinese passengers. Managing Director – TravConsult, Trevor Lee, said engaging the mainland Chinese passenger goes beyond language and begins with the willingness to serve the customer according to their personal and cultural needs. “When staff are equipped with specific skills, knowledge and an understanding of unique service expectations you have a powerful formula for increased sales. “Participants of the Chinese Culture and Customer Service Workshops have reported that once they leave the workshop and apply what they have learned in their retail/duty free stores, the impacts are immediate. “By successfully engaging and then converting sales with one Chinese customer, retailers are often rewarded with the rest of the Chinese group entering the store and making purchases,” Mr Lee said. For the first time this year, BAC also offered Korean and Indian Cultural and Customer Service training as part of the standard Retail Training programs available. “The regular training offered by BAC for international retailers on various Asian markets provides results in more than increased sales. It also assists in refreshing, up-skilling and addressing the continual evolution of key Asian markets like China, India and Korea,” Mr Lee said.